The video for "Take On Me" is one of 22 videos featured on the compilation "The Hits Video Take 2". The cover is blue with the title in large orange and yellow letters in the middle. Pictures of the artists included on the compilation are printed across the top and bottom of the front and back sleeve. The 22 tracks are listed on the back of the sleeve. The inside of the sleeve is white with the tracks printed in black down the left hand side. The laser disc of "Hunting High And Low" has a cover just like the LP, the only difference is the text in the upper left corner: "Digital sound" and the upper right corner: "The compact laserdisc: The Audio and Video Album". The back sleeve has the same photos as the LP whilst the index marking has 13 chapters. The first three are Take On Me, Train Of Thought and Hunting High And Low (all videos) and then comes the 10 tracks from the LP. While they are playing the screen only shows a text information on each track, no video-material. The disc has been repressed several times in the US, but is now deleted. Running Time: 50 minutes. There is also a UK promotional video including these 3 videos (?) - no further details available. UK Promo video Hunting High And Low ? ? 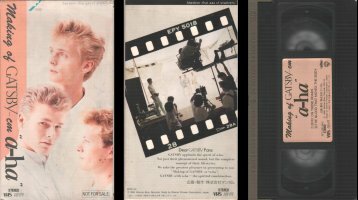 This promotional only video includes the making of the Japanese adverts for new make-up products "Gatsby" (Mandom Corporation) which feature a-ha (running time: approx. 20 minutes). The adverts were made in the 109 Studios, Shibuya, Tokyo and the money from which went to "Worldview International Foundation". On the front sleeve is a band shot (Morten, Mags with Pål behind) dressed in white. The video comes in a side opening card box which fastens shut. The title 'Making of Gatsby - cm "a-ha"' is printed in dark grey letters down the left handside of the front sleeve over a pale pink background. "Madom - that aura of smartness" is printed in small letters in the top right hand corner with "NOT FOR SALE" printed in the bottom right hand corner. The back sleeve features a shot of the band on set, bordered by a segment of film strip (shot 28A). Underneath, the following message is printed "Dear GATSBY Fans GATSBY applauds the spirit of a-ha. Not just their phenomenal sound, but the complete concept of their lifestyles. We take greatest pleasure in presenting to you Making of GATSBY - CM "a-ha". GATSBY with a-ha -- the spirited combination." The video tape is black with a light pink sticker. The title plus "Stay On These Roads" and "The Blood That Moves The Body" are printed in black text on the sticker. Additional information is printed in black at the bottom. The sticker on the spine of the tape is also light pink with the title in black letters. This compilation of promotional videos has sleeve design is similar to that of the album "Headlines And Deadlines" with a band shot (Morten, Magne, Pål) on a petrol blue background. The a-ha logo and title "Headlines And Deadlines The Hits of a-ha" are printed in beige, light blue and white in the lower right hand corner. The back sleeve is black with a band shot at the bottom plus track listing and track details in white, light blue and beige. The reverse of the insert is white with picture adverts for other Warner releases. The cassette tape is black with a white sticker and black text. All tracks are the regular videos used to promote the singles except * which are live recordings from the NRK TV special (1991) and "There's Never A Forever Thing" which is a film of the homeless directed by Lauren Savoy. Note, there was a promotional video made for "I've Been Losing You" (live footage taken from a 1986 US concert), but the live NRK TV version was included in place of this video. Note also the absence of videos for "The Living Daylights" and "Move To Memphis". These two tracks are included on the CD compilation, but have been replaced by "There's Never A Forever Thing" and "Sycamore Leaves" on the video compilation. There was a second pressing of the VHS which is printed in a lighter blue than the first pressing. The font size on the second pressing is also slightly larger and the "VHS HI-FI Stereo DOLBY STEREO" white label on the side is narrower. The reverse of the insert is light blue with picture adverts for other Warner releases, some of which differ from those on the first pressing. The white bar code label on the side of the actual video cassette is also missing. The German made laserdisc (PAL system) of "Headlines And Deadlines The Hits Of A-ha" has a similar front and back cover to the video. The text on the front beneath the main text states: Laserdisc Digital Sound Stereo. There is also a German made DVD of "Headlines And Deadlines" which again has a similar sleeve to the video release. The disc is silver with grey text. First editions come in the hard plastic transparent cases, but later pressings came in the softer plastic cases. The printing colours differ slightly. The DVD includes the extra track, the promotional video for "Move To Memphis" (track 18). There is a German made NTSC edition of the DVD suitable for regions 3, 4 and 6. The cover is similar to the PAL release but the blue background appears to have a more textured look to it (TBC). The disc is also similar to the PAL release, but the text has been printed in a bolder font and there is no "Exempt from classification" text. To coincide with the release of the singles collection 1984-2004, "Headlines And Deadlines" was re-released with a different sleeve (early in 2005?). The content of the DVD is exactly the same as the original DVD release, but the sleeve is quite different. The top section of the sleeve is almost identical to the cover of "The Singles 1984|2004" / "The definitive singles collection 1984-2004". The bottom section of the sleeve uses some of the artwork taken from the album booklet. There is a black strip along the bottom with a white "G" indicating that the content is suitable for general viewing. The DVD claims that it is suitable for regions 2 to 5 rather than 2 to 6 like the first version. Two slightly different versions exist, both come with identical sleeves, but one of the discs is the regular silver DVD with black text, identical to the first release, the other is bronze coloured (this disc is copy protected - TBC). The bronze disc has the newer a-ha logo in light blue at the top with the title in gold underneath. The Warner, DVD and region logos are printed in white at the bottom of the disc and copyright information is printed in white around the edge of the disc. The "bronze-edition" was available as part of the Homecoming / Headlines And Deadlines two DVD set (see below) and was possibly also available separately (TBC). Headlines And Dealines was released on video, but in NTSC format. There were also at least 2 slightly different pressings of an NTSC Japanese laserdisc of Headlines And Deadlines. The laser discs features the same tracks as the VHS, but in addition include the promotional video for "Move To Memphis". The laser discs have slightly different catalogue numbers. One of the laser discs comes with a green obi-strip, the other has a cream coloured obi-strip. There are also 2 slightly different DVD editions, one comes in a card sleeve. Russia: This promo DVD of "Headlines And Deadlines" comes in a plain white sleeve. It is not clear if this is an official item or not. The disc features a black and white shot. Magne can be seen on the right hand side with possibly Paul and Morten(?) in the centre and on the left. There is a "film strip" of smaller pictures along the bottom. a-ha is printed in large black letters at the top with the title in pink and black underneath. Other details unknown. The sleeve of the video differs from the European release in that a coloured border surrounds the pictures. The video also includes "Move To Memphis" as a bonus video track. Japan DVD Headlines And Deadlines Warner Music Vision ? Russia DVD - promo Headlines And Deadlines Warner Music Vision ? The 1992 remix of "The Blood That Moves The Body" is included on the 18 track promo compilation WEA/East West instore video. The Video is the same as the 1988 version but has been over dubbed with the remix. The video comes in a white cardboard sleeve with a white printed label on the front and spine. Tanita Tikaram "You Make The Whole World CryY"
Ian McCulloch "Lover, Lover, Lover"
The Family Stand "Shades Of Blue"
Twisted Sister "We're Not Gonna Take It I Wanna Rock"
RTZ "Until Your Love Comes Back Around"
a-ha "The Blood That Moves The Body"
Chaka Khan "Love You All My Lifetime"
Randy Crawford "Who's Crying Now"
David Byrne "Girls On My Mind"
This live video features video footage from different shows from a-ha's tour of South America in 1991. It also includes some backstage clips. The film was produced and directed by Lauren Savoy. The sleeve features a shot of Morten drooped over his microphone with orange light behind. The title is printed in beige letters at the top of the sleeve with the a-ha logo in white below. The back sleeve is black with shots of the crowd and a back-view shot of the band on stage under green light. Track information and list is printed in beige letters. The video has a U certificate (Universal - Suitable for all). The reverse of the insert includes pictrue adverts of other Warner releases. The cassette tape is black with an orange label with white text. A white sticker on the front sleeve reads "Featuring live versions of Take On Me, The Sun Always Shines On TV, Touchy, Cry Wolf" plus catalogue number. The first pressing has "I've Been Losing You" printed incorrectly as "I'm Losing You". Later pressing have this mistake corrected. They also have the green "Universal" certificate logo in the bottom right hand corner rather than bottom left. On 23 October 2015, "Live In South America" was released as a bonus DVD as part of the deluxe release of the album "East Of The Sun, West Of The Moon". This is the only DVD release of this show. The Brazilian "Live in South America" VHS release is very similar to the European edition displaying the regular front and back cover artworks but the Catalogue number shown is different 10018-3 and does not include the green and white "UNIVERSAL Suitable for all U" triangular logo. The running format is also NTSC rather than PAL. On the back cover, the Manufacturing and distributing information has changed and is printed in Portuguese to read; "Warner Music Brasil Ltda. C.G.C. 42.470.112.0001-56 Produzido na Zona Franca de Manaus por Videolar da Amazonia S.A. C.G.C. 34.502.880.0001-16. Distribuido pela BMG Ariola Discos Ltda. C.G.C. 56.697.162.0002-66 SCDPDPF 5087 – Sao Paulo – Industria Brasileira". There is also some Portuguese Copyright text included; "ATENCAO:O proprietario dos direitos autorais licenciou o filme contido neste videocassete unicamente para uso domestico. Fica proibido qualquer outro uso, copiagem, reproducao ou execucao em publico, aluguel, seja integral ou parcialmente. Os infratores estarao sujeitos as penalidades previstas em lei". At the top of the spine, the regular black and white "WARNER MUSIC VISION" logo is shown, along with the "NTSC" symbol and Catalogue number 10018-3. At the very bottom "Made in Brasil"" is printed in black on a white stripe, replacing the regular "VHS, Hi-Fi, stereo and DOLBY STEREO on linear tracks" information. The video cassette tape is black with a blue and white stickered label on the top displaying the same Manufacturing, distributing and copyright text in Portuguese which appears on the back cover. 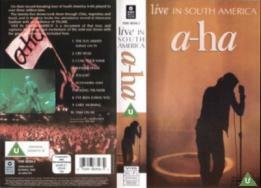 On the front side of the cassette, there is a pink "Videolar" sticker on the left containing some black coded text; "461759 / SEQ-01316" and the title; "A-HA/LIVE IN SOUTH AMERICA", whilst on the right, there is another white sticker with navy blue printed text displaying again the title; "A-HA LIVE IN SOUTH AMERICA" in large lettering, plus "NTSC" symbol, Catalogue number 10018-3 and "WARNER MUSIC VISION" logo. There is a Brazilian Videolar Pressed VHS of a-ha "Live in South America" which comes with a light blue and white video cassette, it is also housed in a usual black video cassette case. This release is very similar to the European release apart from containing some of the Manufacturing text in Portuguese on the back cover. The running format is NTSC. The front cover artworks is exactly the same as the European Pressing with "live IN SOUTH AMERICA a-ha" displayed in White Text at the top and the usual Image of Morten leaning over a microphone stand. On the spine, we have the usual black and white square "WARNER MUSIC VISION" logo at the top, underneath we have the format and catalogue Number 'NTSC 10018-3', the Title 'live IN SOUTH AMERICA' is shown vertically in the centre with 'a-ha' displayed landscaped in brown underneath. The front cover image of Morten is again displayed vertically at the lower half of the Spine. Finally at the very bottom of the spine, we have 'Made In Brasil' printed in black. 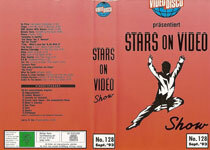 The usual green "Universal" certificate logo and 'VHS/Hi-Fi/stereo/DOLBY STEREO on linear tracks' logos which appears on the European release have been omitted on this Brazilian Videolar VHS Pressing. On the back cover, it's again virtually the same as the European VHS Pressing with the same artworks, Track listing and English tour information at the top. However at the bottom end, the green "Universal" certificate logo, square 'FSK' White Logo & White Barcode has again been Removed from this Brazilian Pressing, although we do additionally have the same Black & Blue 'WARNER MUSIC VISION' Logo, 'APPROXIMATE RUNNING TIME: 60 MINUTES' & "ALL SONGS PUBLISHED BY ATV MUSIC LTD, EXCEPT 3, 4, 7 AND 9 PUBLISHED BY WARNER CHAPPELL MUSIC LTD." information which appears also on the European pressing. ATENCAO:O proprietario dos direitos autorais licenciou o filme contido neste videocassete unicamente para uso domestico. Fica proibido qualquer outro uso, copiagem, reproducao ou execucao em publico, aluguel, seja integral ou parcialmente. Os infratores estarao sujeitos as penalidades previstas em lei. Produzido na Zona Franca de Manaus por Videolar da Amazonia S.A. - CGC 34.502.880/0001-16. Distribuido pela BMG Ariola Discos Ltda. GCG 56.697.162/0002-66 SCDPDPF 50/87 Sao Paulo - Industria Brasileira sob licence da Warner Music Brasil Ltda. Additionally the 'WARNER MUSIC VISION' blue and white logo is also displayed. On the Front Side of the Tape, we have a Pink Label on the Left Hand Side displaying the Catalogue Number 10018-3, Title 'A-HA/LIVE IN SOUTH AMERICA' & other Numbered Coding '002836' & 'SEQ-00306'. On the Right Hand Side, we have a White Label with Black Text displayed the Title 'A-HA LIVE IN SOUTH AMERICA' in Large Capital Letters, Catalogue Number & Format 'NTSC 10018-3' and the 'WARNER MUSIC VISION' Logo. The French edition comes in similar packaging to the European release, but the Catalogue number is slightly longer to display 7599-38356-3 WE 558. There is no green and white "UNIVERSAL" triangular logo printed on the sleeve, plus the "WARNER MUSIC VISION" and "VHS" logos on the spine are slightly larger to show a silver background rather than the usual black or white. The "WARNER MUSIC VISION" font used on the back sleeve is also slightly lighter. The listing shown for the track; "I’VE BEEN LOSING YOU" is printed incorrectly as "I’M LOSING YOU". This French VHS is in SECAM format. The cassette tape itself was supplied by "FUJI" and is black with white printed text, it displays the title along the top "A-HA LIVE IN SOUTH AMERICA", with the Copyright information printed all in French underneath; "Attention, cette videocassette et les ceuvres qui y sont reproduites sont destinees exclusivement a I’usage prive. Tous les autres droits sont reserves. Sauf autorisation expresse des proprietaires des eceuvres, la reproduction, I’edition, I’echange, le pret, I’execution publique et la telediffusion, totale ou partielle, sont formellement interdits. Tout contrevenant s’expose a des sanctions penales et/ou civiles. Cette videocassette ne peut etre exportee, cede ou louee en dehors des pays de la communaute europeenne, sans I’autorisation urealable de Warner Music France". On the left hand side, a large "WARNER MUSIC VISION" logo is shown, along with the text; "DOLBY HI-FI STEREO VHS SECAM DUREE 60 MINUTES CNC / EDV 110". At the bottom right, the Catalogue number 7599-38356-3 and "© 1993 WEA INTERNATIONAL INC A TIME WARNER COMPANY" is additionally displayed. "Live in South America" was also released onto VHS in Japan, it comes instead in a white cassette case rather than the standard clear one. The running format is not shown but appears to be NTSC. The artwork on it is similar to the European release but the layout on the spine is different and displays a-ha orientated rather than landscape with the title printed in Japanese. The picture of Morten holding the microphone has been cropped to show only the top half and is relocated near the top under the black "WARNER MUSIC VISION" logo. At the lower half of the spine, there is a brown oval with some additional Japanese white printed text. The "WB" logo, VHS, Catalogue number WPVP-9106 and two price tags ¥5,500 and ¥5,340 are displayed in black at the very bottom. On the back cover, the "WARNER MUSIC VISION" logo is slighter larger and lighter, plus the white barcode is somewhat smaller and displays a different number "4 988014 591065" compared to the European release. Along the bottom under the regular Copyright information, it displays that the VHS was "Marketed by Warner Music Japan Inc. a Time Warner Company. Made in Japan". The usual Green "UNIVERSAL Suitable for all" triangular logo has not been included on this Japanese release. The Cassette tape itself is black and tan with light brownish stickered top and side labels. 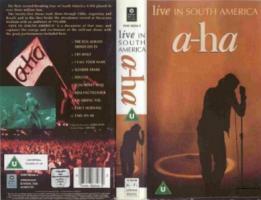 The top label is very similar to the European release having the title "a-ha live IN SOUTH AMERICA" with the full track listing printed in white underneath. The regular black and white "WARNER MUSIC VISION" is also included, along with a black "WB" logo and "E EXEMPT FROM CLASSIFICATION". The Catalogue number WPVP-9106, VHS hi-fi and STEREO are shown in white. The same Copyright and Japanese Marketing information which is displayed on the back cover is also included. On the side label, there is a black "WB" logo at the top, with a-ha and the Japanese title printed orientated in white. The VHS and "WARNER MUSIC VISION" logos and Catalogue number are displayed in black at the bottom. The Video also includes an additional white folded sheet displaying the full track lyrics in both English and Japanese. There are at least 2 slightly different Japanese laserdiscs (NTSC system) of "Live In South America". They have a similar cover to the VHS video release, but have different catalogue numbers. One of these laser discs comes with a green obi-strip with white titles and small shots of other discs available on the back. The Korean VHS of "Live In South America" comes in a slightly larger than normal white video cassette case with the regular front and back cover artwork similar to the European edition, but cropped to include some additional Korean titles on the front cover and spine. There is a green strip, which is included all the way along the bottom, with some additional Korean text shown. The blue and white "WARNER MUSIC VISION" logo is located on the front, back & spine of the case along with an additional "WARNER REPRISE VIDEO" symbol on the back and spine only. Some Korean Manufacturing and Copyright information is displayed on the back cover to include the text; "© 1993 WEA International Inc., A Time Warner Company COPYRIGHT © 1993 SEOUL TELECOM SYSTEM CO. LTD"
The spine itself differs from the European one with a smaller version of part of the Morten shot with a pink outline and is located higher up on the spine. The layout of the a-ha logo and title has changed to both read down the spine with a light grey strip behind. The blue "WARNER MUSIC VISIONO" logo present is much larger compared to that shown on the front and back sleeve, plus a black "Hi-Fi STEREO" symbol is also included. The cassette tape itself is coloured bright yellow and green with white stickered labels on the front and side with titles in red, green and blue text. The blue "WARNER MUSIC VISION" logo is included in the top left hand corner of the top label with the "WARNER REPRISE VIDEO" symbol in the top right. The a-ha logo is printed in red and located in the centre showing the title "LIVE IN SOUTH AMERICA" in green and Korean translation in blue underneath. A green stripe similar to that shown on the casing is included along the bottom with some other additional Korean text printed in blue. On the side label, the "WARNER MUSIC VISION" logo is displayed orientated again in the usual blue on the left hand side, with the a-ha red logo and Green and blue English/Korean title landscaped in the middle. The blue "Hi-Fi STEREO" and "WARNER MUSIC VIDEO" symbols are included orientated on the right, along with a white "VHS" symbol on a green background. When playing the video, there is some additional Korean information displayed before the show starts. This German promo compilation video "Stars On Video Show" (No. 128 Sept. '93) features a mixture of forthcoming pop videos and film releases including a preview / shortened version of the first banned version of "Dark Is The Night" (track 13 - 3:18) which fades out around 30 seconds before the end. It also contains the Kinohitparade Countdown of the Top 10 Film Releases. The running time is approximately 1 hour 14 minutes. The cover is red with titles in black and a black and white drawing of a man leaping. The "Video Disco" logo is printed in red, white and blue at the top of the front sleeve and on the spine. The video cassette is black with a white sticker with titles in black. In 2000, there was a "Special Edition" DVD and VHS release of the James Bond film "The Living Daylights" (titled Der Hauch Des Todes in Germany and Iskallt Uppdrag in Sweden). The DVD (and VHS?) includes the promotional video of a-ha's "The Living Daylights", The Making of this music video plus an a-ha and John Barry interview as bonus material. Germany DVD The Living Daylights (Der Hauch Des Todes) United Artists ? A promotional video cassette of "Summer Moved On" was produced in Spain. The cover features the artwork from the "Minor Earth | Major Sky" album placed at an angle over a background of desert and sky. The a-ha logo is printed in large black letters above and the title in smaller black letters below. The back sleeve features more of the desert and blue sky with a large black a-ha logo and the text "su nuevo video summer moved on" below. The spine is black with the title in white. The cassette is black with a black label with the title printed in white. 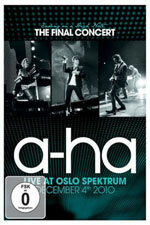 This live release features the full show (excluding the final encore "Angel") taken from a-ha's performance at Vallhall, Oslo, Norway on 24th March 2001. 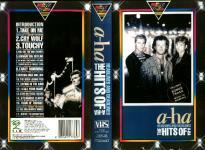 The first versions of the DVD and VHS were available as a "limited edition" exclusively through www.a-ha.com and don't have a catalogue number. The DVD release features around an hour and half of bonus material including a documentary on what the band members have been up to individually since the release of their previous album, interview, backstage feature on a-ha, after fan party footage, band facts, 4 promo videos (Summer Moved On, Minor Earth Major Sky, Velvet (kissing version), I Wish I Cared [previously only available through a-ha.com]) plus additional live footage from Grimstad 19th May 2001 (Early Morning and Summer Moved On). The bonus material on the video is only the 4 promotional videos plus the live footage from Grimstad. DVDs and videos available through a-ha.com were produced in both NTSC and PAL with versions suitable for the different world regions. The cover of the limited edition DVD and VHS is light blue, pink and orange with a faded shot of Morten and backing band at the top. 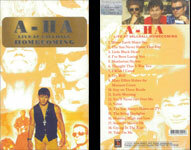 The title "a-ha live at vallhall homecoming" is printed in white across the middle. The DVD has "limited edition" printed on a lime green circular background in the bottom right hand corner. The back sleeve is also light blue, pink and orange with a faded live shot. Text in white about a-ha's comeback in 2000 has been printed over part of the orange background with text about the concerts in Oslo on 24 and 25 March 2001 printed in black over part of the blue background. The back sleeve of the DVD states that it is "all regions" although NTSC versions are also available which have an NTSC sticker on the back. The DVD comes with a 4-page double sided booklet with colour shots of the band on stage plus track information. The disc of the DVD has the front cover shot and text screen-printed on it. The NTSC edition is the same but with additional "NTSC" text printed on it. The video doesn't come with a booklet and the inside of the insert is blank, so the tracks are not listed at all. The cassette itself is black with a white bordered black label with white text. The a-ha.com limited editions come with an exclusive limited edition live CD featuring a-ha's set from the Grimstad show at Fjæreheia, Norway, on 19th May 2001 (Stay On These Roads / Early Morning / You'll Never Get Over Me / Summer Moved On), plus The Living Daylights taken from Vallhall, Oslo 25th March 2001 and Angel from Vallhall Oslo 24th March 2001. The bonus disc is of similar design to the DVD. Note: * items are included as bonus material on the video edition. "The year 2000 marked the triumphant return of a-ha to the international scene. After a seven-year break, the band reformed and released the CD "Minor Earth Major Sky" to widespread critical acclaim, and scored a European hit with the single "Summer Moved On". Having completed a successful tour of Japan and Europe, a-ha returned to their native Norway on the 24th and 25th of March 2001, for two two sell-out shows at Oslo's new football arena; Vallhall. This DVD is a recording of the first night. This DVD contains lots of extra material, including documentation of their seven years apart, interviews, unreleased live footage, and 4 videos from "Minor Earth Major Sky""
Note: There is a spelling mistake on the a-ha.com release: documentation is printed incorrectly as "documentatition". The DVD and video were also released to record stores across the world (Norway - 20/05/02, Japan - 20/05/02, Europe 27/05/02, UK - 10/06/02, Australia - 15/07/02, Canada - 15/10/02, plus USA and Brazil around the same time as in Canada). These releases do not come with the exclusive bonus CD, but include the same bonus material. The front covers are similar to the version released via the internet, but the "limited edition"-circle on the DVD is replaced by the DVD trademark. There is also a blue rectangular sticker on the front with the text "Features all of their greatest hits including: 'Cry Wolf' 'The Sun Always Shines On TV' 'The Living Daylights' and 'Take On Me'" plus catalogue number in white. The video edition has an additional white round sticker with the text "ALSO AVAILABLE ON DVD VIDO". The back covers are quite different and include the track listing in two columns at the top of the sleeve. The text about the return in 2000 and concerts in 2001 is the same, but is printed right across the back sleeve. The DVD includes some format and running time information printed on black rectangular strips. There is also additional "Warner Music Vision", format, "Exempt from classification" and copyright text on both the DVD and video sleeve. The DVD disc also differs slightly from the a-ha.com version with less of a silver border around the edge plus additional PAL, DVD, Warner Music Vision and "Exempt from classification" logos, catalogue number, running time and copyright information in white. The DVD comes with the 4-page booklet with the same live shots, but slightly different text. The reverse of the video insert is of same design as the front side, but without any of the text. It doesn't come with any other booklet insert. The cassette itself is black with a bright pink sticker with titles in white. France: The French VHS is similar to the European release but the information on the back cover is in French rather than English and it's in SECAM format. 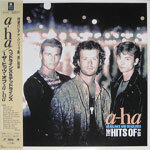 The Japanese release has the same front sleeve as the European release, but on the front is a green sticker with a-ha and some Japanese text printed in white. There is also a promo DVD of "Vallhall" which comes in a jewel case. The cover is light brown with Japanese text in black. The date "2002/5/22" printed top right and "Promotion Only Not For Sale" is printed at the bottom. The disc is plain with the title, catalogue number and "Not For Sale" printed in white on an orange rectangle at the bottom of the disc. The DVD comes with a negative strip which features the "Hoemcoming" sleeve. The South African release was manufactured in Europe, but distributed in South Africa by Gallo. 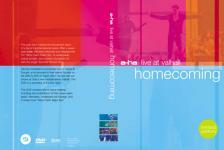 "Live at Vallhall - Homecoming" was available on video in the Ukraine. It comes in a paper slide-in-box with unique artwork. The front cover features yellow-orange and white shots of the band as background image with a colour photo of Morten in the foreground. The title is printed in black on a gold background at the top of the sleeve. The spine and back cover feature more of the yellow-orange and white background images. The title is printed in red on the spine with Bon-video logo, Hi-Fi Stereo and VHS logos underneath. The back cover has the title and track listing printed in red text down the sleeve. The Bon-video logo is printed at the bottom. It is thought that this release is unofficial since there is no catalogue number. South Africa DVD (PAL) Live at Vallhall - Homecoming 092 744 864 2? This limited edition DVD of a-ha videos was given away by the Spanish record store "FNAC" with purchases of the live double album of How Can I Sleep With Your Voice In My Head. The DVD comes in a 5" card sleeve with a brown and white band shot on the front (Paul, Magne, Morten) and track listing on reverse. 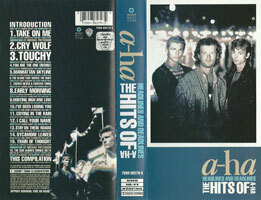 The title "a-ha The Videos" is printed in white on the front and reverse of the sleeve. The disc features the cover shot of the band, but in black and white. The title is printed in white letters on the top right hand side of the disc. The DVD features 13 promotional videos (mastered as only 1 track on the DVD) including the original video for "I've Been Losing You" (printed incorrectly as "I've been loosing you"), the live video of "The Sun Always Shines On TV", the slightly different version of Crying In The Rain (compared to that on Headlines And Deadlines) plus "Forever Not Yours", "Lifelines", "Did Anyone Apprach You?" and "The Living Daylights" which have not been previously released on Headlines And Deadlines or Live at Vallhall. The total running time is 55 minutes. The film "One Night at McCool's" includes the promotional video of "Velvet" as bonus material. The UK DVD release includes both video versions of "Velvet" - the 'licking version' and the 'kissing version'. The Norwegian version includes only the 'kissing version' and the US release (10/9/01) includes only the 'licking version' - information to be confirmed. Norway DVD One Night at McCool's ? This compilation DVD release includes the promotional video of "Lifelines". This WEA (Warner) promo only DVD collection features Minor Earth Major Sky live at vallhall by a-ha plus videos by 10 other artists. 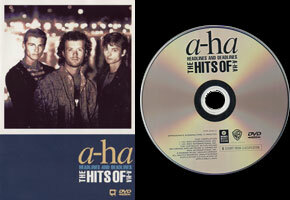 The cover and disc features pictures of the artists featured on the DVD including a-ha taken from the Headlines and Deadlines album cover and live shots of the band members (on the disc). Previously only available on video, these two films featuring Morten acting the part of Kristoffer were released on DVD. The covers of both DVDs feature artist drawings of characters in the film. Morten is featured mid-right on the cover of "Kamilla og Tyven" (getting married) and in two places on the cover of "Kamilla og Tyven del 2" (in an small aircraft with his brother, Kjetil, and in his car). The back of the sleeves features pictures plus information about the films. The discs are picture discs with more drawings of the characters in the films, similar to the front sleeves. The DVDs include bonus material. This promo only DVD-R features both versions of the video for "Celice" (Explicit version and Soft version). The DVD comes in a black Universal card wallet with a white sticker with the following text: A-HA "Celice" Promotional Video Clip 1. Explicit Version 2. Soft Version Not for broadcast 2005 Universal Greece. Similar text is printed in black on the disc. A second edition of this promo features a third version of the video. The disc and packaging are similar to the other promo, but the sticker has the following text: A-HA "Celice" Promotional Video Clip 1. Version 3 - Final Edit (Versions 1+2 not to be used). Not for broadcast. 2005 Universal Greece. 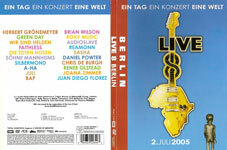 There were 4 DVDs available featuring live tracks by the artists who performed at Live 8 in Paris, Berlin, Roma and Toronto on 2 July 2005. 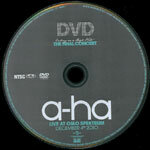 The Berlin DVD features 20 tracks including "Take On Me" performed live by a-ha. All four DVDs have similar covers, blue with the Live 8 'Africa guitar' logo in the centre, the date underneath and the back view of a naked poverty-stricken child. The location is printed down the side on a coloured strip: Paris on blue, Berlin on red, Roma on green and Toronto on orange. The back of the Berlin sleeve is white with a blue strip across the top with the text "ein tag ein konzert eine welt" the names of the featured artists printed in coloured letters in the centre and additional black text at the bottom. The DVD comes with an insert featuring a cartoon drawing of the poverty-stricken naked child facing a table of cakes and sweets at which some of the world leaders are sitting. There is a world map behind the table and the flags in front. The text "Live 8 July 2nd 2005" is printed in large black letters at the top. The back and inside of the insert are blue with the track listing and messages from Paul Valley and Bob Geldof in German. The disc features part of the cartoon picture from the insert. All four DVDs are available together in a box set. The deluxe limited edition 13-track enhanced CD of "Analogue" comes in a limited edition digi-pak. As well as the web player, it includes a bonus 25 minute long DVD with three songs from Frognerparken (Celice, Analogue, Cosy Prisons), video edit of "Celice" (cut on the "Thomas Schumacher Radio Edit"), interview clips taken from the EPK. The limited edition version has a similar cover to the regular release, but it comes in a double fold-out card digi-sleeve, so there are a few minor differences in the layout. The booklet which comes with the digi-pak is the same as the one which comes with the regular edition. The reverse of the digi-pak has the track list on the left hand side with the listing for the bonus DVD on the right. The disc is the same as the disc of the regular edition and even has the same catalogue number printed on it. The DVD is of similar design to the CD, but the arty patterns are less black and more white and grey. This promo only DVD-R features the video for "Analogue" plus a-ha's appearance on "CD:UK" (The Sun Always Shines On TV, Analogue and interview) - total 15 minutes play time. It comes in a black Universal card wallet with a white sticker with the track details plus the following text: A-HA "Analogue (All I Want)" Promotional Video Clip Performance on CD:UK. Not for broadcast 2006 Universal Greece. This promo only DVD-R features the video for "Cosy Prisons". It comes in a black Universal card wallet with a white sticker with the following text: A-HA "Cosy Prisons" Promotional Video Clip Not for broadcast 2006 Universal Greece. The previously released "Live at Vallhall - Homecoming" and "Headlines And Deadlines - The Hits Of a-ha" was re-released as a 2 DVD set on 27 November 2006. The DVDs come inside a cardboard slip case, the front cover of which features some of the pink and orange artwork from the Homecoming DVD at the top and the group shot from the 2005 re-release of "Headlines and Deadlines" DVD over a light blue background at the bottom. The a-ha logo is printed in large white letters at the top with the DVD titles underneath. The back of the slip-case is blue with pictures of the two DVDs included at the top and tracks listed below. The a-ha logo is printed in white at the top with "2-DVD Collection" printed in black over the top. This is also printed on the blue spine. Inside the card sleeve is the regular release of the Live at Vallhall DVD plus the re-issue "bronze disc" edition of "Headlines And Deadlines" (see above). 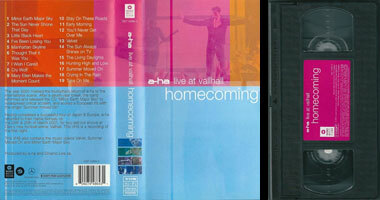 Live at Vallhall - Homecoming was released in a CD & DVD "Classic Performance Live" set which comes in a fold-out digi-pak. The cover is white with a picture of the regular Vallhall sleeve in the centre. "Classic Performance Live A-HA" is priinted in black and pink letters in the top left. The "Sight & Sound" logo is printed in the bottom right hand corner in black, grey and pink. Some of the tracks includes on the CD & DVD set are listed in the bottom left on a pink background. The reverse of the sleeve is white with the DVD tracks listed in pink on the left and the CD tracks listed in grey on the right. The DVD is white with black, pink and silver text, while the CD is pink with black, white and silver text. The discs are housed in clear plastic trays. Through the left hand tray you can see other titles by different artists in the same series while through the right hand tray you can red track information. The DVD disc 1 features the live Vallhall show, while the CD disc 2 features the 19 tracks from the show, but in a different running order and have been faded out. This German promo only DVD-R features the video for "Foot Of The Mountain". The disc is white with a picture of a pony printed in black at the top. 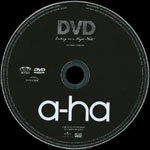 "Musikvideo A-HA "Foot Of The Mountain"" (3:36) is printed in black at the bottom of the disc. The DVD logo is printed on the right hand side with track information on the left hand side. The disc comes in a Po Ny Film Company digipak sleeve. There is a Greece promo only DVD-R which features the video for "Foot Of The Mountain" (quoted as being 3:07 long, but is actually the usual 3:36). It comes in a standard black Universal Greece promotional card wallet with a white sticker with the following text: A-HA "Foot Of The Mountain" Promotional Video Clip Duration: 3:07 mins Not for broadcast 2009 Universal Greece. The disc is silver with black text. A deluxe edition of "Foot Of The Mountain" was released in Germany on 4 December which includes a DVD in addition to the regular album The CD+DVD set comes in a fold-out digi-pak. The cover is similar to the regular album, but has a large "FSK ab 0 freigegeben" DVD rating in the bottom left hand corner. The CD sits in a clear tray on the left hand side of the digi-pak through which you can se some abstract art. In a similar way, the DVD sits on the right hand side. The DVD is of similar design to the CD, but is printed in blue tones rather than colours. The CD booklet sits in a pocket in the middle of the digi-pak. The booklet is the same as the one which comes with the regular album, but has four additional pages at the back with extra photos, information and track listing of the DVD. The UK deluxe edition of "25" comes in a triple CD case with a bonus DVD of the videos. The artwork is similar to the regular album release but the catalogue number differs. The booklet and back sleeve for the deluxe edition has the DVD track listing alongside the CD track lists. Discs 1 and 2 are identical to the regular release. There is a blue rectangular sticker on the front, similar to the one on the regular release, which advertises the bonus DVD. The disc of the DVD is of similar design to the CDs, but the ring around the centre is white and "DVD - THE VIDEOS" is printed in white on the right hand side. There are some editing issues on the DVD with several of the videos having the wrong soundtrack, using the album versions cut to match, rather than the single versions (The Sun Always Shines On T.V., Summer Moved On, Velvet, Forever Not Yours, Lifelines, Celice, Foot Of The Mountain). Also the video for "The Sun Always Shines On TV" has an additional piece of American footage tagged on the end! Although this release is unofficial, it was produced for the offical fan party following the penultimate a-ha concert on 3 December 2010. 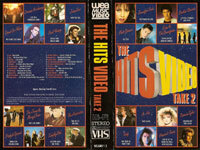 It features interview clips from across the years and all of the a-ha promo videos. The quality of some of the interview clips is fairly low, but subtitles are included. The DVD comes in a card wallet sleeve. The front artwork is black with coloured pieces of foil 'falling from the sky'. The title is printed in large white letters at the top of the sleeve. The disc is similar to the front sleeve. The back sleeve is white with the following text in black. "Thank you for celebrating a-ha's amazing career with us! With grateful thanks to the fan party crew:" plus list of 10 names printed in two columns. "Enclosed DVD presentation by Wesley Myers. www.a-ha.com" is printed at the bottom of the sleeve. On 1 April 2011, a-ha released a CD and DVD of their last ever concert in Oslo on 4 December "Ending On A High Note - The Final Concert" in Norway, Germany and some other parts of the world. It was released in the US on 12 April and in the UK on 25 April. There were separate CD, DVD, deluxe DVD (2 CDs and DVD) and Bluray editions. The Bluray and Deluxe editions also include a documentary and a gallery of photos by Stian Andersen. The cover features three individual black and white shots of the band members on stage (Magne, Morten, Paul). Above and below the pictures are aqua coloured spot lights. The title is in aqua and white letters at the top of the sleeve. 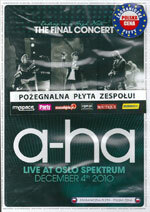 A large white a-ha logo has been printed underneath the pictures with "Live at Oslo Spektrum December 4th 2010" printed in aqua below. The cover of the German editions have a large DVD rating "FSK 0" sticker in the bottom left hand corner. The Deluxe edition has the additional "Deluxe Edition" printed in white at the bottom of the sleeve. The DVD edition comes in a plastic DVD case which has a gold sticker with white and black text "The farewell show incl. all hits & singles" plus a list of 5 of the tracks and catalogue number in the top left corner of the front of the case. The DVD comes with an 8 page double sided booklet which features black and white shots of the band at their final concert, information and quotes from the band plus DVD track listing. It is similar to the the booklet of the CD release although the layout of the pictures differs slightly due to the different size and the picture of Paul jumping replaces that of the band walking towards the stage. The back cover is covered in aqua lights on a black background with the tracks listed in aqua down the centre plus bar code and other text in white below. The back side of the insert is the shot of the band standing at the edge of the stage while the crowd gets covered in ticker tape. The DVD itself is black with the titles in white and aqua. The "FSK 0" rating is printed in white and black on the right hand side of the disc. The Deluxe edition has the additional "Deluxe Edition" printed in white at the bottom of the front sleeve, it comes in a 4-way digi-pak. The left hand end houses the 10 page double-sided booklet, the two CDs are in the middle and the DVD is on the right hand end. The booklet is similar to that which comes with the DVD, they both include the same information and quotes from the band plus track listing and similar black and white shots of the band at their final concert, but the ordering and layout differs. The two CDs are aqua coloured with the disc number and title in white and back at the top and the a-ha logo and "Live at Oslo Spektrum December 4th 2010" in white and black at the bottom. The DVD is of similar design to the CDs, but the disc is black and the text is white and aqua (the same as the regular DVD but with a different catalogue number). The "FSK 0" rating is printed on the right hand side of the disc (UK, German and Norwegian editions). Once the two ends of the digi-pak have been closed, a black and white picture of the audience getting covered in ticker tape and the band standing on the edge of the stage can be seen across both sides. The back of the digi-pak features more of the aqua lights with "Deluxe Edition" at the top in white and the tracks listed below, the CD tracks on the left and the DVD tracks on the right. The front packaging has a gold sticker (bottom left on Norwegian edition / bottom right on the German edition) which is similar to that on the regular DVD but has the additional text "+Backstage documentary + Photo gallery" and different catalogue number. The Blu-ray edition is packaged similarly to the DVD edition, but comes in a standard blue Blu-ray case. It features the same footage as the deluxe edition with the bonus backstage documentary and photo gallery. It comes with the gold sticker in the top left hand corner. 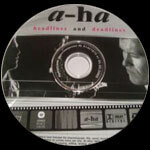 The disc is white, of similar design to the regular DVD, but with the titles in aqua and black and a-ha logo in aqua. It includes the "FSK 0" rating on the right hand side but there is no PAL or DVD logo on the left hand side. The UK test pressing of the DVD comes in a clear plastic wallet and features the same material as the regular release, including the extra documentary and photo gallery. The disc is silver with black titles: "A-HA 2764849 14.03.2011 ENTERTAINMENT DISTRIBUTION COMPANY Testpressing - not for sale". Copyright information is printed around the edge of the disc with a slight printing fault at the start as part of the first words are missing. Deluxe editions: See Ending On A High Note album. The Argentinian DVD is similar to the European edition, but is in NTSC format. It has the same cover sleeve as the Malaysian release, with the same catalogue printed on it. However, the disc, sticker and the back of the insert booklet have a different catalogue number. The gold "farewell show" sticker is on the front cover along with the small rectangular "ifpi" hologram sticker. The DVD is black and has Argentinian record company and copyright information printed around the outer rim. The NTSC, DVD Video and "AADI/CAPIF" logos are printed to the left of the centre hole. All of the text is printed in white on the disc and "THE FINAL CONCERT" and "LIVE AT OSLO SPEKTRUM DECEMBER 4th 2010" are printed in small white capital letters, rather than in the large aqua font. There is an Brazilian Sonopress DVD only Release of A-ha Ending On A High Note, it's in NTSC Format (Not PAL) and the actual DVD Case is similar to the European Pressing with some differences. On the front of the DVD Case, there is a gold Brazilian sticker with black and white text: "O SHOW DE DESPEDIDA! Inclui todos os grandes sucessos: Take on me Stay on these roads Hunting high and low The living daylights Foot of the mountain e muitas outras! 60252768722". On the back cover of this Brazilian Sonopress DVD, the track listing is exactly the same as the European pressing, under this, we have the barcode which is twice the size compared to the European Pressing, the catalogue number and issue coding is then displayed AA0005000 60252768722. Under this, there is the Record Company and copyright information in English: "FILM & ARTWORK C 2011 CHART PROMOTIONS LTD. UNDER EXCLUSIVE LICENSE TO WE LOVE MUSIC. DISTRIBUTED BY UNIVERSAL MUSIC DOMESTIC POP. A DIVISION OF UNIVERSAL MUSIC GMBH. A UNIVERSAL MUSIC GROUP COMPANY. ALL RIGHTS RESERVED. UNAUTHORISED COPYING, REPRODUCTION, HIRING, LENDING, PUBLIC PERFORMANCE AND BROADCASTING OF THIS DVD PROHIBITED. BIEM/SDRM. LC 19045.". There is also some Brazilian record company information including website addresses: " Produzido no Polo Industrial de Manaus e distibuido por Sonopress Rimo Industria Comercio Fonografica S.A. - Industria Brasileira - Rua lca. no 100-A - Distrito Industrial - Manaus - AM. CNPJ: 67.562.884/0004-91, sob licenca da Universal Music International Ltda. CNPJ: 08.975.642/0001-18. Denuncle a pirataria: www.apdif.org.br www.universalmusic.com.br O prazo de validade do DVD e indeterminado, desde que observados os seguintes cuidados: Armazenar em lugar seco com umidade nao acima de 60 g/m3 e temperatura Nao superior a 55 graus, livre de poeira, nao dobrar, nao engordurar e segurar o disco sempre pela lateral e o furo central.". After this is the disc, sound and subtitle information: "DISC: DVD-9* NTSC. REGIONS: ALL. AUDIO: DOLBY STEREO. DOLBY DIGITAL 5.1 SURROUND SOUND AND DTS 5.1 SURROUND SOUND, SCREEN 16:9 WIDESCREEN. MENUS: ENGLISH. SUBTITLES: ITALIANO, FRANCAIS, DEUTSCH, ESPANOL, PYCCKNN, NORSK. DTS AND THE DTS LOGO ARE TRADEMARKS OF DIGITAL THEATRE SYSTEMS, INC. DOLBY AND THE DOUBLE-D SYMBOL ARE TRADEMARKS OF DOLBY LABORATORIES LICENSING CORPORATION. *Camada Dupla. Podera ocorrer uma interrupcao na troca de camada." At the very bottom of the back cover there is the usual 'Universal Music', 'WE LOVE MUSIC', 'DVD Video' and 'DOLBY DIGITAL' logos which are also shown on the European Pressing DVD, however on this Brazilian Pressing, we additionally have the NTSC (Instead of PAL), Region ALL (Instead of Region 0) and The usual Brazilian Flying Amazon Bird Logo. The actual disc is again very similar to the European pressing, although the following differs: On the left hand side there is the Record company information in English, instead of being around the outer edge of the disc, it reads: "FILM & ARTWORK C 2001 CHART PROMOTIONS LTD. UNDER EXCLUSIVE LICENSE TO WE LOVE MUSIC. DISTRIBUTED BY UNIVERSAL MUSIC DOMESTIC POP. A DIVISION OF UNIVERSAL MUSIC GMBH. A UNIVERSAL MUSIC GROUP COMPANY. ALL RIGHTS RESERVED> BIEM/SDRM. LC 19045.". The catalogue number 60252768722 is displayed underneath. To the Right Hand Side of the disc, the Logos 'Universal Music Group International' and 'WE LOVE MUSIC' are displayed, (these appeared at the bottom centre of the disc on the European Pressing). At the bottom centre of this Brazilian Sonopress DVD is the logo 'DVD VIDEO' in White. Around the outer edge of the disc all in Portuguese is the Record Company and Copyright Information which reads:- "PRODUZIDO NO POLO INDUSTRIAL DE MANAUS E DISTRIBUIDO POR SONOPRESS RIMO INDUSTRIA E COMERCIO FONOGRAFICA S.A. - INDUSTRIA BRASILEIRA - RUA ICA, No 100-A - DISTRITO INDUSTRIAL - MANAUS - AM. CNPJ: 67.562.884/0004-91, SOB LICENCA DA UNIVERSAL MUSIC INTERNATIONAL LTDA. CNPJ: 08.975.642/0001-18. TODOS OS DIREITOS RESERVADOS PROIBIDA A REPRODUCCAO, EXECUCAO PUBLICA E LOCACAO DESAUTORIZADAS SOB AS PENAS DA LEI.". Printed in white text around the centre ring of the disc is the issue coding, AA5000, displaying that 5000 copies were Produced. The German promo DVD comes in a wallet-style card sleeve. The design of the sleeve is very similar to the regular release but has the additional text "For promotional use only" printed on the sleeve and disc. The Polish DVD is similar to the EU release, but has a white, blue and red "ZAGRANICZNE POLSKA CENA PLYTY" logo in the bottom right hand corner plus the same text printed all around the outside edge of the cover. It comes with two stickers on the front cover: a red, white and blue circular sticker with the text "ZAGRANICZNE POLSKA CENA PLYTY" and a long black and white sticker with the text "POZEGNALNA PLYTA ZESPOLU!" with six advertising logos. On the back cover there is a silver hologram sticker with the text "ZPAV ZAiKS" and "EE 7809921" plus a small white sticker with Universalmusic.pl contact information. The Malaysian DVD release is made in the EU and NTSC format. It comes with a silver Malaysia original product hologram sticker on the top left of the front cover. There is a beige circular censorship certificate sticker on the back cover. It comes with the same insert booklet as the UK PAL release. The disc is dark grey, rather than black. The South African DVD similar to the European release, but is in NTSC format. It has the regular gold "farewell show" sticker on the front. There are two additional logos printed on the back sleeve, "RISA" and a triangular "fpb PG" logo. There is also "South Africa Universal Music Group" record company information on the back cover. 1984 Take On Me (original) Blue toned video with girls dancing. Available on 25 deluxe edition. 1985 Take On Me Semi-animated animated 'comic book' video filmed in a cafe in Wandsworth (west London). Directed by Steve Barron. Available on Headlines & Deadlines, a-ha The Videos, 25 deluxe edition DVD, Hunting High And Low video / LD, The Last Hurrah. 1985 The Sun Always Shines On TV Filmed in "St Albans" cathedral full of Mannequins in Teddington (SW London). Continues story where Take On Me ends. Directed by Steve Barron. Available on Headlines & Deadlines, 25 deluxe edition and The Last Hurrah. 1986 Train Of Thought Semi-animated video filmed in Los Angeles, includes a piece of film "commuter" by Michael Patterson. Directed by Candace Reckinger & Michael Patterson. Two slightly different versions available. Available on Headlines & Deadlines, Hunting High And Low video / LD and The Last Hurrah. 1986 Hunting High And Low Filmed in West London. Morten changes from eagle to shark to lion in order to conquer the air, sea and land. Directed by Steve Barron. Available on Headlines & Deadlines, a-ha The Videos DVD, Hunting High And Low video / LD and The Last Hurrah. 1986 I've Been Losing You Live video, filmed during the US tour, late summer 1986. Directed by Knut Bry. Available on a-ha The Videos, 25 deluxe edition DVD and The Last Hurrah. 1986 Cry Wolf Based on pop-up book, filmed at a chateau near Mercury. Directed by Steve Barron. Available on Headlines & Deadlines and The Last Hurrah. 1987 Manhattan Skyline Band featured in a crossword puzzle and in a wind tunnel. Directed by Steve Barron. Available on Headlines & Deadlines and a-ha The Videos, 25 deluxe edition DVD and The Last Hurrah. 1987 The Living Daylights Includes film clips from the James Bond film "The Living Daylights". Available on a-ha The Videos DVD and The Last Hurrah. 1988 Stay On These Roads On motorbikes on the Norfolk coast (UK). Directed by Andy Morahan. Available on Headlines & Deadlines, a-ha The Videos, 25 deluxe edition DVD and The Last Hurrah. 1988 The Blood That Moves The Body Video filmed in Paris (clips in a house / streets and concert). Directed by Andy Morahan. Available on Headlines & Deadlines and The Last Hurrah. 1988 Touchy! Filmed in Deauville and Paris (France) on a beach and swimming pool with synchronised swimmers. Directed by Kevin Moloney. Available on Headlines & Deadlines and The Last Hurrah. 1988 You Are The One In sailors outfits in the streets of New York. Directed by Damon Heath. There are two slightly different versions, the regular version and one with trumpets. Regular version available on Headlines & Deadlines and The Last Hurrah. 1990 Crying In The Rain Filmed in Montana, North America. Directed by Steve Barron, Two slightly different versions of the video exist, one with more shots of Morten singing. Directed by Steve Barron. One version available on Headlines & Deadlines and 25 deluxe edition, the other on a-ha The Videos DVD (with extra shots of Morten singing) and The Last Hurrah. 1990 I Call Your Name Recorded in the studio. Two different versions exist, one black and white, one colour. Directed by Lauren Savoy. Available on Headlines & Deadlines (black & white version), The Last Hurrah (black & white version) and on 1-track promotional video (both versions?). 1991 Early Morning Includes clips from a-ha in Brazil for Rock In Rio II. Directed by Michael Burlingame. Available on Headlines & Deadlines DVD (black & white version), The Last Hurrah and on a 1 track promotional video. 1991 I've Been Losing You Live studio video recorded for NRK TV (Norway). Directed by Odd Arvid Stromstad. Available on Headlines & Deadlines. 1991 Sycamore Leaves Live studio video recorded for NRK TV (Norway). Directed by Odd Arvid Stromstad. Available on Headlines & Deadlines and The Last Hurrah. 1991 There's Never A Forever Thing Film of the Homeless. Directed by Lauren Savoy. Available on Headlines & Deadlines, The Last Hurrah. 1991 Move To Memphis Brown tone video featuing French actress Beatrice Dalle. Directed by Erick Ifergan. Available on Headlines & Deadlines and 25 deluxe edition and The Last Hurrah. 1992 The Blood That Moves The Body Same video as the '88 verion, but overdubbed with the new mix. Available on WEA compilation promotional video. 1993 Dark Is The Night Abstract shapes and men with sticks. Directed by Eric Ifergan. Two different versions as first version was banned in the States. The banned version available on 25 deluxe edition DVD and The Last Hurrah. Both versions available on 1 track promotional videos. 1993 Angel Filmed at Silvertown Bridge (East London) and at a house near London, features model Jasmine Lewis in car crash. Two slightly different versions exist, one features MTV competition winner standing at the side of the road. Available on 25 deluxe edition DVD and The Last Hurrah DVD. Both versions available on 1 track promotional videos. 1994 Shapes That Goes Together Band performing in the studio under orangy light. Directed by Barry Maguire. Available on25 deluxe edition DVD, The Last Hurrah DVD and 1 track promotional video. 2000 Summer Moved On Filmed at sunrise on a beach in Cadiz, Andalucia, Spain. Directed by Adam Berg. Available on Live at Vallhall, Minor Earth, Major Sky single, a-ha The Videos and 25 deluxe edition DVD. 2000 Minor Earth, Major Sky a-ha land on the moon in their astronaut outfits. Filmed in a deserted place near Prague. Directed by Philip Stolzl. Available on Live at Vallhall, Minor Earth, Major Box and a-ha The Videos and 25 deluxe edition DVD. 2000 Velvet Morten found in bath, Paul shot in head, Magne in freezer, all taken to the Mortuary. Two different versions exist. One where nurse kisses Morten, the other she licks his face! Directed by Harald Zwart. Available on Live at Vallhall (kissing version), Velvet single and 25 deluxe edition (licking version) and One Night at McCool's DVD (both versions). 2001 I Wish I Cared Flash video, originally on www.a-ha.com. Available on Live at Vallhall DVD. 2002 Forever Not Yours a-ha, animals and other 'famous people' enter the 'arc'. The video was filmed in Havana, Cuba. Directed by Harald Zwart. Available on a-ha The Videos DVD. 2002 Lifelines Based on the Norwegian short film "A Year along the Abandoned Road", directed by Morten Skallerud (1991). The film was shot in Børfjord, a semi-deserted fisherman's village in Northern Norway and was filmed through all seasons and played at speed. Directed by Morten Skallerud. Available on 1-track VHS PAL stereo video, running time 4:21, produced by Vanderquest for Warner Music. Also available on Lifelines single, a-ha The Videos, Bravo and 25 deluxe edition DVD. 2002 Did Anyone Approach You? Filmed before, during and after concert at Ullevaal, Oslo June 2002. Filmed and directed by Lauren Savoy. Available on Did Anyone Approach You? single, a-ha The Videos and 25 deluxe edition DVD. 2003 The Sun Always Shines On TV Live Filmed by Lauren Savoy during the 2002 tour. Clips from backstage and live. Directed by Lauren Savoy. Available on The Sun... live single and a-ha The Videos DVD. 2005 Celice Directed by Jörn Heitmann and recorded in Berlin (31 August 2005). Features shots in a brothel. Three different versions produced, available on Celice promo DVD from Greece, one of the versions available on the Celice CD single and Analogue deluxe album. 2005 Analogue Directed by Howard Greenhalgh and recorded at Littlebrook Power Station in Dartford, Kent, UK. Available on Analogue (All I want) CD single and on Analogue promo DVD from Greece. 2006 Cosy Prisons Directed by Paul Gore and filmed at the Abbey Mills Pumping Station in London. Available on Cosy Prisons promo DVD from Greece. 2009 Foot Of The Mountain Available on Foot Of The Mountain promo DVD and Foot Of The Mountain deluxe edition with DVD from Germany. 2009 Shadowside Available on Foot Of The Mountain deluxe edition with DVD from Germany. 2009 Nothing Is Keeping You Here Available on Foot Of The Mountain deluxe edition with DVD from Germany. 2010 Butterfly (The Last Hurrah) Clips from previous a-ha videos and shots of the band outside, filmed in England. Directed by Steve Barron. Available on 25 deluxe edition DVD.